Tennessean troubadour Kenny Chesney and Grammy winning Georgian Zac Brown Band headline Nu Country TV in our floral tribute theme on Saturday September 30 at 9 pm on Channel 31/Digital 44. Nashville hit writers Cadillac Three and Oklahoma born Texan outlaw Ray Wylie Hubbard who helped them launch their third album Legacy at the famed Ryman both return to the show repeated Monday at 8 am. Prolific Queensland born singer-songwriter-producer Shane Nicholson returns to the show filmed and edited by Laith Graham. Expatriate Kiwi singer-songwriter Matt Joe Gow partners with touring partner Katya Harrop in their debut as a duo. Tennessean Kenny Chesney recruited university volunteers to film his summer break video for All The Pretty Girls from his 17th album Cosmic Hallelujah. He also anonymously flew two siblings from the Caribbean in his private jet to their Philadelphia home after they were stranded by Hurricane Irma. Teenagers Jah-Haile and Jahbioseh Bruce were in their childhood home on St. John. They survived Irma with their grandfather but lost everything and were taken to St. Croix on a private boat. A woman, whose sons own the boat, gave them shelter but plans to fly home to their mother in Philadelphia were stymied by lack of commercial flights until Chesney stepped in. The Bruces were told an anonymous donor offered a private jet to get them to Philadelphia . CNN revealed it was Chesney who had been using his plane to get supplies to areas hit by Irma. "I've never been in war, but the devastation, the people's faces in a place I know by heart have left me feeling helpless," Chesney revealed of Irma's deadly aftermath. "It's total devastation. I want to enlist my friends to figure out the best ways to make a difference, to help in whatever ways, small or larger, that we can. And I know the No Shoes Nation is mighty. They've dug in before and made a difference." Chesney is recording and producing a new line of merchandise to aid victims of Irma. Kenny owns a home on the Caribbean island of St John where he wed actress Renée Zellweger on May 9, 2005. They met in January at a tsunami relief event but on September 15 the same year, after only four months of marriage, they announced their annulment. 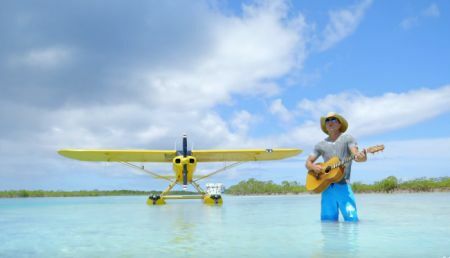 Chesney's island home influences his music as he spends most of his time off the road there. He was born in Knoxville and raised in Luttrell, East Tennessee - similar geographical roots to the late Chet Atkins. But recent albums with escapist titles Poets and Pirates, Hemingway's Whiskey, When The Sun Goes Down, No Shoes, No Shirts, No Problems and Lucky Old Sun have a distinct island flavour. Kenny also releases his 27 song 18th album Live In No Shoes Nation on October 27. It features Eric Church, Mac McAnally, Taylor Swift, David Lee Murphy, Old Dominion , Grace Potter, Taylor Swift and Dave Matthews. Kenny performs prophetic Everybody Wants To Go To Heaven (But No-One Wants To Die ) with fellow Nu Country TV headliners - Zac Brown Band. CLICK HERE for a Kenny Chesney feature in The Diary on December 12, 2016. 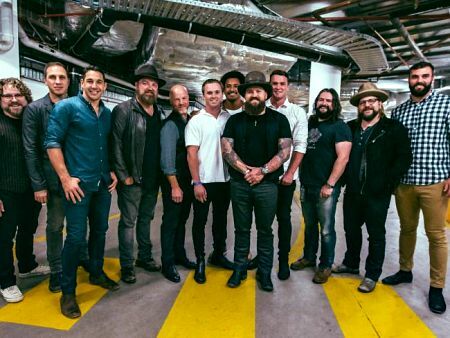 Frequent Australian tourists the Zac Brown Band return on a live trip to their musical mecca in Georgia and way beyond in Roots from their nostalgic eighth album Welcome Home. Zac, 39 and father of five, visited Byron Bay on a search and discovery mission long before his recording career began. It was the inspiration for his embryonic hit Free. Brown shares a strong sporting fan base in Australia with Arizona born singing pilot Dierks Bentley whose Palais concert audience included now retired St Kilda captain Nick Riewoldt and Carlton retirees Andrew Walker and David Ellingham. Melbourne Storm star Billy Slater, who hasn't retired, and team-mates including Cooper Cronk were among fans who soaked up Zac's magic at his April gig at Margaret Court Arena with East Ringwood raised Pierce Brothers. CLICK HERE for their Concert Review on April 19. 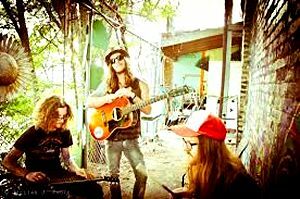 Tennessean hit writers Cadillac Three take viewers on a road trip through their culture in American Slang from their third album Legacy. They wrote it with Massachusetts minstrel Lori McKenna, 49 and mother of five - a frequent guest on Nu Country. Guitarist Daren Johnston has written hits including You Gonna Fly and Raise Em Up for expat Australasian superstar Keith Urban and Eric Church, Southern Girl and Meanwhile Back At Mamas for singing actor Tim McGraw and others for Jake Owen and Frankie Ballard. They launched Legacy at the famed Ryman in August with Ray Wylie Hubbard who returns this week in Behind Bars. Johnston met multi-instrumentalist Kelby Ray Caldwell and drummer Neil Mason 20 years ago at Hillsboro high school in Nashville . “This record is a little bit more grown up and the fact that we have experienced more and there is more to life,” Johnston revealed. They previously appeared on Nu Country with White Lighting and Florida Georgia Line , Texan Mike Eli of the Eli Young Band and Dierks Bentley in its video for All About The South . On January 15, 2014, the group, originally Cadillac Black , played its song on popular TV series Nashville and followed with third single I'm Southern . "We couldn't get the trademark to Cadillac Black because there was a band called Black Cadillac ," says lap steel/bassist/vocalist Caldwell . "Lawyers ruin all the fun." The performed as American Bang after Mason graduated from high school band the Dahlia Llamas . Texan outlaw Ray Wylie Hubbard revisits an historic house of sin with white rose bouquets in a trip through his back pages on Behind Bars. House of The White Rose Bouquet is on aptly titled 17th disc Tell The Devil I'm Getting There As Fast As I Can. The singer revisits stories of the downtrodden and makes them resemble superheroes in Lucifer and the Fallen Angels and Old Wolf on the album that ends with songs closer to hymns than hell. Eric Church, who name-checked Hubbard in his song Mr. Misunderstood , and Lucinda Williams guest on the title track. Austin singer-songwriter Patty Griffin appears on finale In Times of Cold and Texan band The Bright Light Social Hour emerge on psychedelic The Rebellious Sons . “There's a definite beginning, middle, and end to this record,” Hubbard revealed. The album was recorded at The Zone in Dripping Springs Texas, with Lucas on lead guitar, touring drummer Kyle Schneider, Jeff Plankenhorn on dobro and mandolin, Bukka Allen on B3 organ, and studio owner Mike Morgan and engineer Pat Manskee on bass. Ray Wylie previously appeared in Behind Bars with his live version of Stone Blind Horses from his 16th album The Ruffian's Misfortune on his Bordello Records . Ray co-wrote Bad On Fords with Ronnie Dunn - it appears on Ruffian's Misfortune and was also covered by Sammy Hagar in 2013. That was 40 years after Jerry Jeff Walker cut Hubbard anthemic song Up Against the Wall, Redneck Mother in 1973. Ray Wylie also released autobiography memoir A Life Well Lived in 2015 and wrote the screenplay for 2010 western The Last Rites of Ransom Pride starring Kris Kristofferson and Dwight Yoakam. 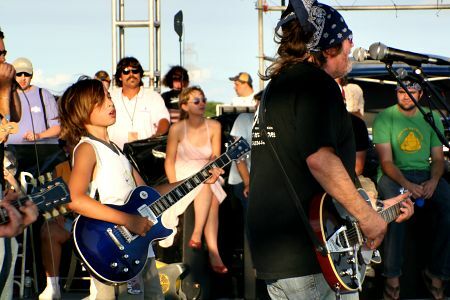 Hubbard nurtured guitarist son Lucas in his band since he was 12 and has been writing and recording with fellow Texan Hayes Carll who toured here twice. Lucas taught a Geelong Amateurs footballer how to throw his Texas Longhorns gridiron ball at Willie's July 3 picnic at Carl's Corner in 2006. Ray Wylie and Hayes Carll wrote Drunken Poet's Dream - entrée song on Carll's 2008 album Trouble In Mind. Eight time Golden Guitar winner Shane Nicholson returns to Nu Country with his love song for a new belle. His evocative song Safe is on his seventh solo album Love & Blood released in July. 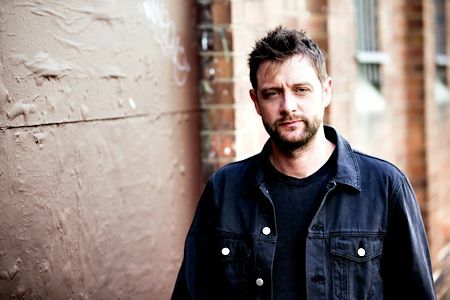 Prolific producer Shane, now 41, wrote it for his new partner after releasing two duet discs with his former singing spouse Kasey Chambers. Nicholson previously appeared on Nu Country in his humorous video for Weight Of The World from sixth solo album Hell Breaks Loose. Shane credits historic Hermannsburg - 130 km from Alice Springs and home of fellow singer-songwriter Warren H Williams - as his salvation, rejuvenation and birthplace of Hell Breaks Loose, produced by Matt Fell. CLICK HERE for a feature story on Hell Breaks Loose in the Diary on August 24, 2015. Expatriate Kiwi Matt Joe Gow returns to Nu Country with Katya Harrop - his tour harmoniser - on Flowers In Your Hair. It's not a direct descendant of the Scott McKenzie San Francisco hit. Gow is touring to promote the song from his second album Seven Years. Matt joined famous movie stars in the snow and surf in a historic flashback in his previous video for Bottle It Up, Pass It On Down. He rode a mystery train from Lawrenceville in Georgia as he transplanted scenes from famous 1967 movie Valley Of The Dolls . Video director Chris Elliott resurrected actors Barbara Parkins, Paul Burke, Patty Duke and late Manson family murder victim Sharon Tate who appeared in the movie with Jacqueline Susann - writer of the book on which it was based. CLICK HERE for a Matt Joe Gow CD review in The Diary on October 3, 2016.